Did You Know that Red Heart’s Website is Bilingual? Let me tell you a few tips! A great question came in from a fan asking about Red Heart Patterns Terms. The question pertains to the choices of words used in patterns. Is a Single Crochet actually a single or is it actually a Double Crochet if you are British? On the top left of Red Heart’s website is a BOX asking you to select your country. RedHeart.com defaults to North American Version. For those in England or those who use UK Version terms for reading crochet / knitting patterns, you would want the British version. The patterns inside this website are all in British terminology. If you are North American and not familiar with these terms, your results will be wrong or you will be confused as not all the same terms are used. There’s a difference. While on The Crochet Crowd, some British crocheters complain about the lack of access to some of the North American yarns by Red Heart in England. The same truth exists with us here in North America. We don’t have all of the same brands in that the British have. It’s due to where the yarn is manufactured. 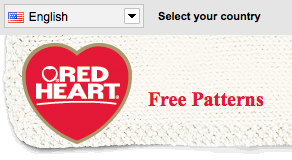 It’s also true that not all of the patterns are the same on each Red Heart website as well. Some patterns were are written by designers outside of North America in the original language for which it was intended. If you are used to German or British Terminology, just change the country on the top of the Red Heart website. That will open up 1000’s of new patterns that you might have not known existed… Enjoy. 5 Responses to Did You Know that Red Heart’s Website is Bilingual? Let me tell you a few tips! ReadHeart.de is GERMAN not Dutch! Thank you… I corrected that… sorry about that. I appreciate the useful information I have received from your posts.